Long term Red Ochre collaborators – Context – based in Utrecht undertake many social enterprise support programmes globally. Regularly the learning from the work is published to make to better disseminate the findings. 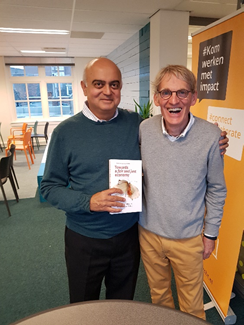 The latest publication – Towards a Fair and Just Economy – was launched at a very well-attended event at the Impact Factory in Utrecht on the 25th of October. The key chapter in the book explores a new social enterprise business model that has improved the lives and livelihoods of apple farmers in the Indian Himalayas. A Dutch philanthropic organisation invested in creating an apple buying and marketing cooperative – managed by a professional manager. The apples are sold by the cooperative rather than through layers of distributors and middlemen. Fair trade and guaranteed prices ensure that the farmers no longer need to turn to extortionate money lenders. The profits the marketing operation makes are used to buy out the investor and transfer ownership to the framers. Other chapters explore other aspects of social enterprise and social business. 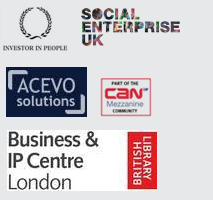 One of the chapters was a contribution from Uday Thakkar on Mentoring of Social Entrepreneurs – a UK perspective. 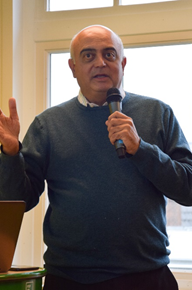 Uday and Fons van der Velden – the founder of Context and major contributor to the publication. 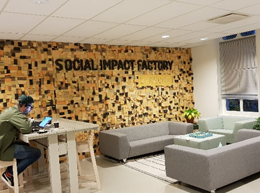 Uday also had the opportunity of meeting with the directors of the Impact Factory in Utrecht who offer space and support to changemakers and are exploring a move into social investment. 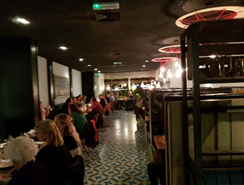 The book launch was followed by dinner at The Colour Kitchen – a social enterprise that creates jobs for those at a disadvantage to the labour market and the restaurant uses food that is otherwise going to be thrown out by retailers and wholesalers. Uday can vouch for the quality of the meal and the excellent service from the trainees waiting staff. A worthwhile enterprise. Published: November 7, 2018. Categories: News and Uday's Blog.